I’m not sure what sort of cultural mishmashmushing went on to bring the Mongolian BBQ style of restaurant to my neighborhood here in the U.S., but I’m grateful for it. For those who aren’t familiar with these little dining gems, the prototypical Mongolian BBQ that I’m familiar with is a pretty loose, customer-driven sort of place. Diners take a bowl and fill it with whatever they feel like from a food bar. This usually means some hodgepodge of vegetables, some noodles, some thinly sliced meats and some sauces. These are then given to a cook who drops the mess on a big round cooking surface and proceeds to stir up the goods as they make a couple of circuits around the hotplate. It doesn’t take long, and in pretty short order, the cook hands the customer a new bowl with their neatly prepared meal. There’s not much protocol to this experience. Diners take what food they want and pile it as high as they like. Most MBBQ places offer a couple of bowl sizes for differing appetites, but it’s all the same; give the customer a bowl and let them go to town. Maybe George over there is a vegetarian, so he piles on the carrots, water chestnuts, celery and mushrooms, tops it with noodles and some sauces. Maybe Junie over here loves chicken stir fry and collects some peppers, bean sprouts, celery and chicken slices, skipping the noodles, planning on putting it on rice instead. Maybe Dafydd is a meat lover and just throws in noodles, pork, chicken, beef and some lemon sauce. It’s a nice freeform menu. The fun part is that the cooks don’t particularly care. They do the same thing for every customer. They plop the food on the hotplate, stir it around a bit with a professional flourish, make sure the meats cook enough, and serve the goods in the same old bowls that everyone gets. It’s a remarkably low-impact process for the providers; they prepare the food for the gathering bar and then just cook whatever people collect. And yet, there’s a marvelous variety in possible meals. Sure, it’s almost always going to be something at least vaguely Oriental instead of a big old T-bone steak or curry cupcakes, but even within that controlled chaos, based on a couple dozen ingredients, there’s a ton of room for customer choice. In game design terms, then, the devs do the same thing for everyone, but the experience is largely up to the customer, because they are given a lot of control over what parts of the game engine and content they want to partake of. This is the design space Minecraft occupies. It sets some ground rules, gives players tools, operates by some consistent rules, and then just lets go of the reins. DC Universe Online apparently has some significant customization options, something that makes a lot of sense in a world where everyone is a Hero. In the dance between Order and Chaos, then, sometimes it pays off to embrace a little chaos. If the dev process is the same for everyone (low chaos for the production team, which is nice for a budget and schedule), and the player brings their own agency to the table, crazy fun things can happen. I think you need to set bounds, to be sure, so that you don’t wind up with complete chaos, but still, players will naturally want to do their own thing. That’s one of the big selling points of games over movies or books. I think that impulse should be leveraged, not suppressed. It’s hard sometimes to let go and let players play, especially in a multiplayer venue, but then, that’s when emergent gameplay and awesome weird stuff happens. It certainly works well for the Mongolian BBQs of the world. Yes, some people will always want Wendy’s or TGIF, but then, there’s nothing saying you can’t have both, just for different meals. I still don’t really like doing a lot of these potpourri posts, but there are a few things I wanted to call attention to and comment briefly on, and the 140 character Twitter limit just doesn’t work for this. That’s an interesting metric I hadn’t heard of before. I wonder how many players will think that’s too long… or too short. In fact, we think the game is more fun overall when you play with friends, which is why we put so much effort into encouraging players to join guilds for Cataclysm. I maintain that guild levels and perks just increase the selfish “use the other guy” mercenary nature of guilds, rather than foster friendship. That’s always what happens when you have to bribe people to play together. Some friendships might form by the wayside, but I think the cost (increasing selfishness coated in gooey guildy goodness) outweighs the benefit. You shouldn’t need to invoke a silent majority if you can make an articulate and salient point. Oh, if only that were understood by pundits of all sorts. I believe that MMOs should be about the player’s story in a vital virtual world that’s indifferent to them. If I want to be the Big Dang Hero in a RPG story, I’ll play Chrono Trigger again or maybe finally pick up FFXIII. Story always clashes with player autonomy, and I’ve felt for a long time that I’d rather have autonomy in a virtual world than a big ol’ story. I’d rather tell my own story, rather than play through the exact same Hero’s Journey that everyone else does (with all the cognitive dissonance that involves). Speaking of story, the Rampant Coyote notes that Story Isn’t Cheating. It’s a great article that touches on a variety of things that I’ve thought about regarding game design over the last few years. It seems to me that pure interactivity (Tetris, Chess) and pure storytelling (film, novels) have their niches, and that the potential of games is playing in the murky middle ground of the spectrum that mixes narrative with interaction. My college education was all about making movies (I’m a computer animator by training with a fair dose of technical competency), but I have found that games are more interesting to me as a vehicle for storytelling. Sure, I’m working on a novel and a couple of pure games based in the same IP I’ve created, but it’s the weird middle zone between them that makes my imagination really spark. That’s why I still prefer game development to other jobs that might be more financially lucrative or stable. Someday the economy might force my hand, but for now, I’m enjoying tinkering in the badlands. That’s where I think the best games are found. When it comes time to actually play games, though, I need to start digging up. (When you’re in a hole, digging yourself in deeper, stop digging down, and dig up.) Thanks to Steam, my birthday and Christmas, I’m more behind than I have ever been on games I want to play and finish. I’m in the middle of A World of Keflings, ilomilo, Raskulls, Dragon Quest V, Prince of Persia (the XBox 360 2008 game that Shamus loved for many of the same reasons I love it, despite the inevitable warts), Batman: Arkham Asylum, Recettear, The Dig, Wizard 101, Mr. Robot and probably a few others I’m forgetting. I really want to play Greed Corp., Chime and Indiana Jones and the Fate of Atlantis, games I bought via Steam on deep discount for those mythical days “when I have time”. I’d even like to dig into Fract, apparently a sort of Myst-Tron hybrid. Sounds like yummy cinnamon and dark chocolate fudge to me. Oh, and I’d like to do at least one quick playthrough of each zone in WoW, raids excluded. I have a gift card for two months that I’ll use one of these days to try to blaze through and get some screenshots. Y’know, once I finish illustrating this book for my mom. The book that was supposed to be done more than a year ago. And after all that, I want to finalize my six player chess-inspired game and a tabletop miniatures game, write some novels and do some other paintings. Oh, and speaking of work, we’re doing “art challenges” again. The theme for January is “Greek Myth”. I’m not sure if we’ll post other artists’ work on the company blog, but I hope so. If nothing else, I’ll post what I come up with when it’s done. I’m limiting myself to 8 hours of work in 1080p format. We’ll see how it turns out. Two hours and plenty of revisions into the project, with a fair bit of Clockworks and Percy Jackson on the mind? What if Prometheus (one of the more interesting Greek mythology characters to me) was also behind the Industrial Revolution? 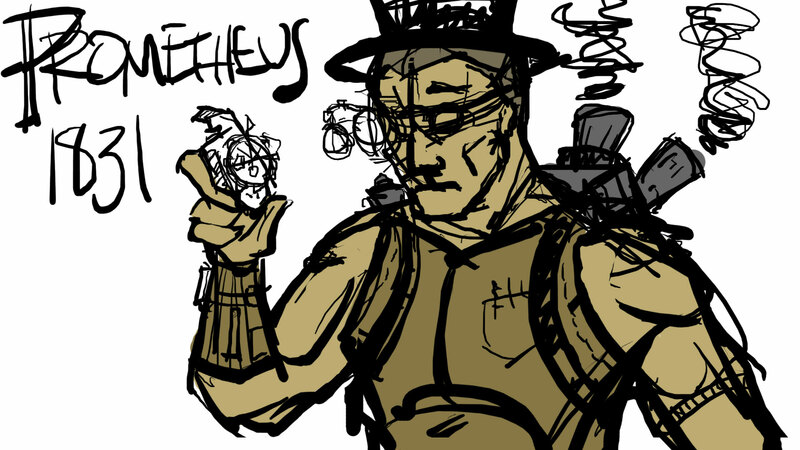 Yay for Steampunk/Greek Mythology mashups, hm? That’s a lot of story to tell in one illustration, though, so I’m going with a fun portrait of Prometheus instead. One really must learn to limit the scope of a project that’s actually supposed to get finished. Bonus link: Dresden Codak artist Aaron Diaz talks about Costumes. Too bad he’s doing futuresciencepunk instead of steampunk. In my more meditative moods, I find myself inexorably drawn to photographs of entropy, and vistas that clearly show the ravages of time. Perhaps it started when I was very young, and one of the most interesting road trips my family took was one to an old abandoned town. I don’t remember much of it, just that I found it endlessly fascinating to explore and look around at the old “ghost” buildings. Old windows, thicker at the bottom than at the top, showed the age and resilience of hand-crafted homes, ignored by looters. The relics of a forgotten people and a forgotten age resonated with me, by all accounts an extraordinarily somber and introspective child. Some people find these things depressing. Some of the photos from this fascinating photo diary of a decaying Detroit can certainly be on the more gloomy side, if one is inclined to think along those lines. This collection of photographs from a local ghost town (Eureka, UT) might be empty at first glance, but then, there are stories to be told there. These artifacts of a not-so-long-ago culture aren’t just spawned ex nihilo, they are evidence that people lived, loved and dreamed. I find that curiously uplifting and hopeful, not depressing. People did the best with what they had and then moved on. Time isn’t an enemy, it’s just part of life. Perhaps that’s the key for me. I don’t imagine the pain and the loss involved in the inevitable mortality of man and the works of man’s hands, I consider the good times. I look at the things that get left behind and wonder why they weren’t taken along. I wonder why that building was built, and why the road bends over there. It’s an occasion to exercise my imagination and whimsy, taking a mental journey to those days when a home was new and a family moved in in excitement, or a theater proudly enticed the town to a evening of entertainment. I imagine the music that once echoed in a dance hall, or the smells that filled a diner. I listen for the whispers of ghosts, telling stories of their glory days and remembering their loved ones, happy with how they lived, not mourning that they are no longer doing so. Mortality for me is a curious blend of living in the moment, wistfully remembering and honoring the past, and wishfully thinking ahead. I believe that we need to understand as much of the full spectrum of time as possible, that the past has a great deal to teach the present, and that looking ahead means little without understanding where we’ve been and where we are. There’s also a curious fascination I have with just how time and nature ravage the things we so often erect in hubris, monuments to our own ego. It’s almost like, as a species, we spit in the face of reality and try to bend nature to our whim, but no matter how much we believe we are masters of all we survey, we always lose in the long run. Nature operates on a geological time scale, and we’re just a blip in the calendar. It breaks us and grinds us down in very interesting ways, but somehow, we fight the good fight anyway. Disasters are also fascinating. From the very-close-to-home, very real loss of a cherished historical building like the Provo Tabernacle to the vast fictional spread of dystopic storytelling in various media, I am deeply interested in how time and entropy leave their mark. Sometimes we bring destruction on ourselves, sometimes it just happens, sometimes it’s fast, sometimes it’s slow, but in the end, everything falls apart. I find it fascinating to see how other people lived and what they prioritized. There are usually lessons to be learned. This is why I love looking through photographs of ancient Greece or the not-quite-so-ancient Scotland. It’s why I love taking photographs of old things and even just nature and how it falls apart. A newly built city, all shining glass and metal, bling and bluster, neon and noise… it’s just not very interesting. It’s complex and intricate, yes, but it’s… sterile. It’s not “lived in” or loved, it’s just a facade. (In a nutshell, the Millennium Falcon is far more interesting than Queen Amidala’s mirror ship.) It can even be creepy, as Mirror’s Edge (and plenty of other fiction) tries to illustrate. Clean just doesn’t stay clean on a large scale without some extraordinary statist efforts. This also echoes the Uncanny Valley effect; real people have many, many small flaws that fabricated people just don’t have, from quirks of movement to freckles, wrinkles and asymmetry. Our faces show the effects of time in quirky ways, and it’s fiendishly hard to fake that. This is also very fertile ground for storytelling and even game narrative. There’s a huge amount of story that can be hinted at by crafting worlds that look lived in rather than pristine. After all, here in the Real World, we don’t live in a world that started with our birth, we’re just one player on an aged stage that existed long before us and will go on long after we’re gone. There’s a strong sense of place and presence to be found in sifting through the evidences of the past. Especially if they are falling apart. I’ve been remiss in my self-imposed promotional duties thanks to a self-imposed blog blackout for the holidays. As it happens, just a couple of days before Christmas, we released our latest XBox Live game, A World of Keflings. And best of all… musical cannons! Anyone who loved the music part of Mario Paint or its PC incarnation should have a blast with this fun little feature. Oh, and as for what I did on this game, I built and textured a lot of the buildings, most of the terrain for the Forest kingdom and a smattering of other things like some of the resources, a couple of Keflings and Builders, and worked extensively on the intro cinematic. I spent a lot of time on a lot of different things in this game, and had a lot of fun with it. I even like playing it after sinking hours into making it, which tends to be a good sign. I also intend to write about the production a bit, but that’s one of those back burner things. Oh, and welcome to 2011, all!